Cut the bacon into bite-sized pieces. Cook the bacon in a frying pan until it’s browned and starting to crisp up. Add in the beef and cook about 10 minutes to brown. Remove from heat and stir in the cheese and scallions. Allow to cool. Open your package of biscuits. One by one, flatten out each biscuit into a square shape. It doesn't have to be perfect. Add a big scoop of the beef mixture to the biscuit. Fold the corners of the dough so they meet on top of the beef mixture to form the shape, making sure the meat is poking out from the corners. Press the top together really well because it will want to come apart in the oven. Bake about 15 minutes at 450°F until cooked and starting to brown. Cool and serve with ketchup and mustard. Share these bacon cheeseburger appetizers with friends at your next game day party! Sometimes you want that tasty burger flavor but packaged in a different way, ya know? This is a perfect recipe for that kind of craving. 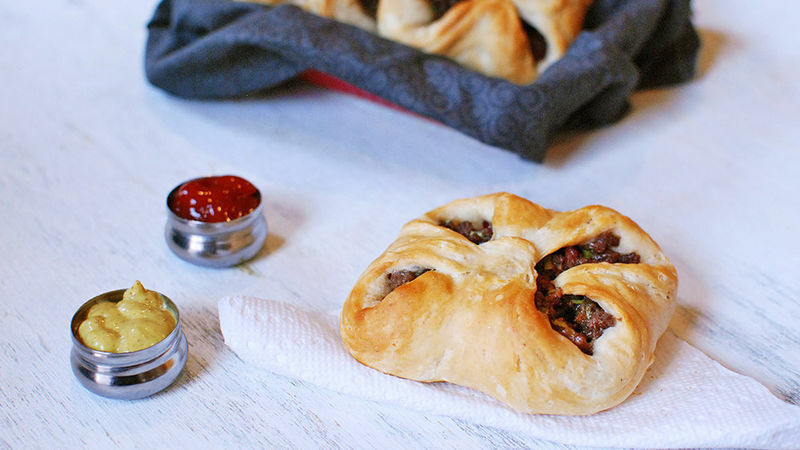 Beef, onion, cheese and a little bit of bacon are all rolled up in a perfect biscuit pocket! I first saw this recipe at Taste of Home and I thought it would be perfect to adapt using Pillsbury Grands! Biscuits. First, brown up your bacon. Then brown up your beef. Once the beef is cooked, remove from heat and add in the scallions and cheese. Crack open the biscuit canister. Flatten out your biscuit dough into a square shape. That filling is looking pretty good, huh? Try not to eat too much as you load it into your biscuits. Or do, what do I care? Make sure to really seal these on top because as the dough expands in the oven it will want to come apart. Nice packages of food, ready to go into the oven. Some might break but that's okay, just eat it quick before anyone sees! Get some ketchup and mustard ready for dipping these tasty little burger treats. They really are a perfect snack for watching a game, or a great little party appetizer! Dan Whalen likes his food in a nice package format. He has been blogging for over 6 years at The Food in my Beard; check Dan's Tablespoon profile often to try his recipes with creative international spins!